Singapore is kind of like a futuristic utopia where all cultures seem to merge, and high-rises and highways mingle with nature. But the cultural melting pot’s common denominator is consumerism, and is underpinned by a tightly regulated civil life, and constrained liberties. And for all the green city planning, Singapore cannot escape the environmental hazards of its Asian neighbors. Imagine a sprawling city with a tree or plant or flower every place one could possibly grow. Concrete balconies have hanging flowers; asphalt streets are lined with trees. Instead of putting a park in the city, Singapore has put the city in a park. At the same time, people come from every ethnic origin — Indian, Chinese, Australian, Japanese, French, Filipino, and every permutation thereof. Mostly they all speak the same language — English. 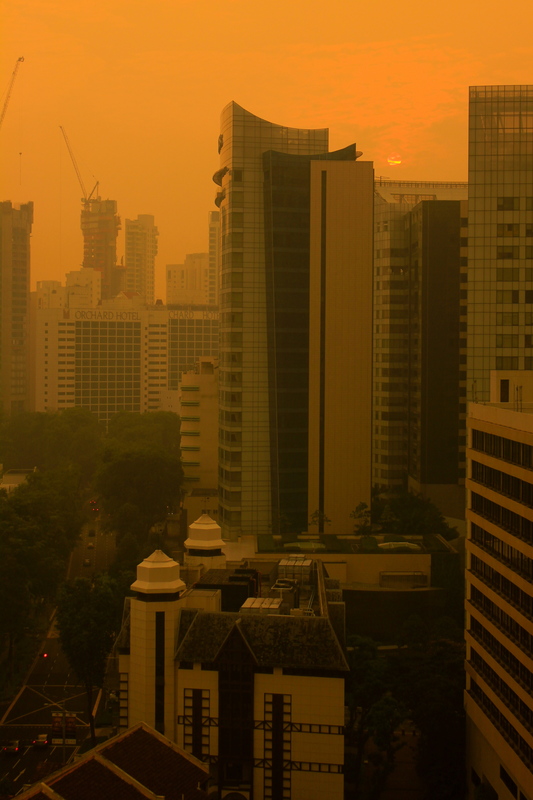 Singapore’s sunrise, seen through the pollution haze. The city is not without its downsides. Today I tried to take an underpass to cross a major road. The underpass itself was part of a massive underground mall, and I couldn’t find my way out for almost an hour. I think I was six stories below ground, and there were still shops with $800 purses. Shopping is literally everywhere here. You are either looking at a tree, an advertisement or a price tag. I guess to bring all those cultures together you have to have a common interest in wearing Prada and drinking $10 coffees. Unfortunately, this green-commercial-utopia is somewhat unsightly now; it’s shrouded in an orange haze, and smells like burning. As I write this, smoke from more than 100 forest fires on the Indonesian island of Sumatra is drifting over the Strait of Malacca and into Malaysia and Singapore, causing the most dangerous levels of air pollution the region has seen in 16 years. Today, the government warned Singaporeans to reduce their time outdoors, especially doing physical activity. As far as I can tell, most Singaporeans are usually trapped in air-conditioned shopping arcades anyway.